The Normandy region of Northwestern France is synonymous with World War II, bringing images of the D-Day Landings to the forefront of many minds. Outside of Normandy’s storied history, the region is known for its rolling hills, orchards and farmland. One of the world’s largest areas for apple production, French cider is Normandy’s signature export. With France known primarily for its wine production, French cider from Normandy stands out as the nectar of the region’s fruitful apple-growing industry. Are you visiting Paris and want nothing more than to see France’s lush countryside? Would you like to learn more about France’s history while tasting some of its finest ciders and champagnes? The Paris Guy offers the best Paris tours designed to satisfy your thirst for knowledge (and libations). We offer a day trip from Paris to Normandy which features visits to the most important World War II sites. Experience the history of the D-Day Landings and break for a Normandy French cider tasting in the surrounding countryside area. Normandy’s economy is primarily agricultural. The region’s main exports include dairy products (milk, cheese and butter), seafood (oysters, scallops and mussels), thoroughbred horses and apples. Normandy harvests over 300,000 cider apples each year. Strict guidelines are employed in the production of French cider. The controls that are regulated include the type of apple, the density of orchards, fermentation and final alcohol levels. A French-style cider is characterized by a rich amber and a bittersweet, over-ripe finish. French ciders are low in acidity, with the perfect balance of sweet and bitter. Some French ciders have a primarily fruity flavor, some have a more bitter profile and others have a combination of both flavors. The apples used to make traditional French cider are bittersweet, cider apples that are low in acidity. Frequin Rouge, Michelin and Muscadet de Dieppe apples give French cider its distinctive profile. The fermentation process that creates French cider is known as keeving. This process involves letting the natural pectin of the apples turn to a jelly-like consistency in cold temperatures over a week. After one week, the pectin jelly begins to rise to the top of the fermentation tank. The movement of the pectin to the top of the fermentation vessel places the juice in between the heavy solids at the bottom of the tank and the jelly at the top. The remaining juice in the middle of the tank is deficient in nutrients. Traditional winemaking and cider-making require the presence of nutrients for the yeast to feed on during the fermentation process. In the process of fermenting French cider, excess nutrients and yeast are removed are siphoned out. The nutrient-deficient juice is then slowly fermented at cold temperatures with small quantities of yeast for 3-6 months. Many French cider-makers will carbonate the cider or pasteurize it before bottling. Normandy’s thriving apple harvesting economy yields the production of three distinct types of ciders: Cidre (traditional French cider), Calvados and Pommeau. Traditional French Cidre is closer in flavor to a sweeter beer than typical American apple cider. The alcohol content for Cidre is very low, no more than 3-5% ABV. Cidre comes in a sweeter doux style or a drier brut style and is traditionally served with crepes. Our food tour through the Le Marais neighborhood of Paris features a crêpe and French cider tasting. 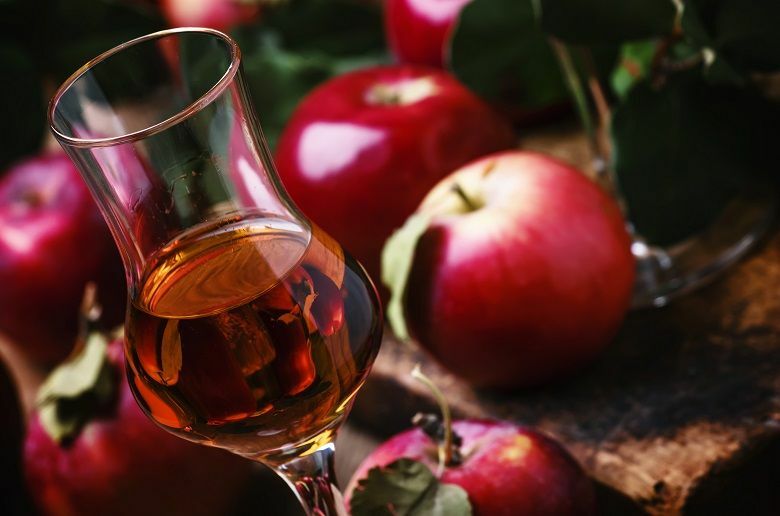 Calvados is made specifically in Normandy and is made using a similar process to cognac, resulting in higher alcohol content than traditional Cidre. Aged in oak casks for at least a year, Calvados is traditionally served after a meal as a digestif. It is also sometimes served as a palate cleanser in preparation for the next course of a multi-course meal. Locals in Normandy refer to this as trou Normand or a Normandy hole. Pommeau is made from a blend of Calvados and unfermented apple juice. This blend is then aged in oak barrels. Alongside the apple flavor, drinkers of Pommeau will notice notes of vanilla and honey. The alcohol content for Pommeau is between 16% to 18% ABV. Pommeau is generally served before meals as an aperitif. If you would like to experience the many flavors of French cider from Normandy for yourself, we offer a Paris food tour through Le Marais and a day trip from Paris to Normandy. Both tours feature authentic French cider tastings. Experience the history, sights, sounds and flavors of France with The Paris Guy! If you want us to arrange the entertainment in Paris, check out our Paris tours. Skip the lines and see all the major attractions in the City of Light with an English-speaking guide. Not sure what to do in Paris? Read about the ten best things to do in Paris. Parlez-Vous Francais? Learn some of the most important French phrases before your trip to Paris. Sparkling Wine vs Champagne – What’s the Difference? Why is the Trevi Fountain Famous? Which of These Are Actually French Foods? Who Painted the Sistine Chapel?